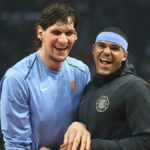 The Philadelphia 76ers made a blockbuster trade with the Los Angeles Clippers for forward Tobias Harris, forward Mike Scott and center Bobman Marjanovic. Sports analysts are applauding the move, with some stating that now Philly has a starting lineup (Harris, Ben Simmons, J.J. Redick, Jimmy Butler, Joel Embiid) that could rival the Golden State Warriors. The NBA trade deadline is February 7th at 3:00 pm so expect some more surprises before then. All eyes are still on New Orleans Pelicans’ Anthony Davis and whether he’ll end up an LA Laker by the trade deadline. On Tuesday night, even the opposing Indiana Pacers’ fans got in to the action when they started chanting “LeBron’s gonna trade you” to Brandon Ingram.